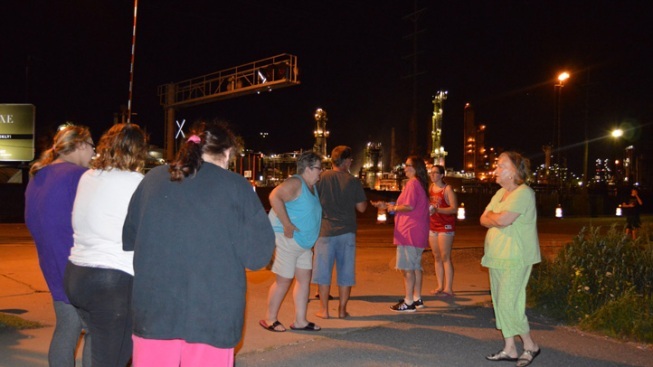 Neighbors who live near the BP refinery gather around after hearing the explosion. Fire broke out Wednesday night after an explosion at the BP refinery in Whiting, Indiana, fire officials said. BP America spokesman Scott Dean confirmed that the Whiting refinery experienced "an operational incident" at about 9 p.m. on the refinery’s north end. The fire was out by 11 p.m. and an "all clear" was issued about 20 minutes later. "Refinery operations were minimally impacted as a result of the incident, and the refinery continues to produce products for customers," Dean said. One refinery employee was taken to a local hospital as a precaution but was later released, he said. Witnesses reported plumes of smoke coming from the facility. The blast was heard as far away as Highland and Griffith. Witness Kenny Hamilton, who lives near the refinery, said the explosion knocked pictures off of his wall and shook his entire house. Wednesday was the anniversary of a disastrous explosion in Whiting. On Aug. 27, 1955, a series of explosions ripped apart the Standard Oil Refinery’s 250-foot tall fluid hydroformer unit 700 in Whiting. Only two were killed but the conflagration is considered one of the worst industrial disasters in the region’s history. According to BP.com, the newly-configured refinery can process up to 102,000 barrels of crude oil per day, delivering up to $1 billion of operating cash flow per year.